Believe it or not, you don’t need a greenhouse to grow crops indoors. Whether you are a city dweller pressed for yard space or homesteader looking to add a little green to the winter months, you can easily start an indoor vegetable garden. Before starting your indoor garden, the first thing you need to consider is space. “Indoor gardening can take up as much or as little space as you’re willing to give up,” says Jennifer Moreno, chairman of indoor gardening at the National Garden Clubs. You can devote as little as a windowsill or as much as an entire room to your indoor gardening endeavor. Just make sure you buy containers that fit properly in the space. It may be best to allocate your plot of floorspace based on which room gets the most light. If you do not have adequate light — either due to the short winter days or your apartment’s lack of windows — don’t give up on your indoor garden. You can purchase grow lights, which imitate the wavelengths of the sun, to prevent your plants from growing too weak and spindly. You can get plant stands with built in lights, but you can also easily suspend lights over plants on racks. Full-spectrum grow lights will provide these wavelengths, either by filtering the light through a special glass, using a chemical mix, or by balancing the right ratio of light output from different colored diodes depending on the type of bulb. Humidity may also be an issue, especially during the winter when the heat is on full blast. If your home is dry, place a few humidifiers in the room where you plan to keep the plants. Plants that are grown indoors also need more frequent watering. Always use room temperature water, and be sure your pots have sufficient drainage. Overwatered or waterlogged plants will wilt and their leaves will become discolored; under-watered plants will develop brown edges along the leaves. You can promote healthy drainage by keeping your plants in good potting soil. Use lots of fertilizer for indoor plants as well; if you compost, you can make a compost tea to give plants extra nutrients by steeping a few scoops of compost in water for a couple days and straining the mixture through a cheesecloth. You may also consider hydroponics, a method of growing plants using water without soil. Herbs are great to grow indoors because they don’t take up much space. You can easily start an indoor herb garden on your windowsill, or if you are setting one up in the winter, one option is to purchase a herb gardening kit that includes a stand with grow lights. Although some crops can be overwintered and stay outside in your garden, others may need a little help. An indoor garden can be used to start or keep crops during the harsh, frosty winters. According to Moreno, peppers, salad greens, carrots, beans, and onions are all great to grow indoors. If you have enough space, you can even grow dwarf varieties of apple and orange trees. Some gardeners are surprised that tomatoes grow well indoors; while most plants require insects or wind for pollination, tomatoes pollinate themselves, so you can have juicy, fresh fruits all winter long. 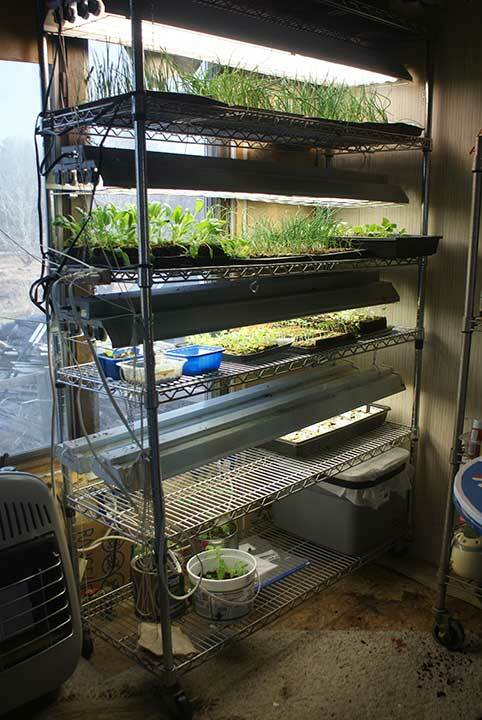 You can also use your indoor garden to start crops that you will eventually transplant outside when the weather warms. When the spring comes, the plants will have to go through a process called “hardening off,” where they have to be slowly exposed to the elements. Moreno says that you should plan to place your indoor plants outside (ideally in a cold frame for a little extra protection) for a few hours about 7 or 10 days before you plan to transplant them, slowly increasing the time they are exposed during the day and bringing them back inside each night. When the day finally comes to add them to your outdoor garden, you should ideally wait for some cloud cover so they are not exposed to the harsh full sun right away. 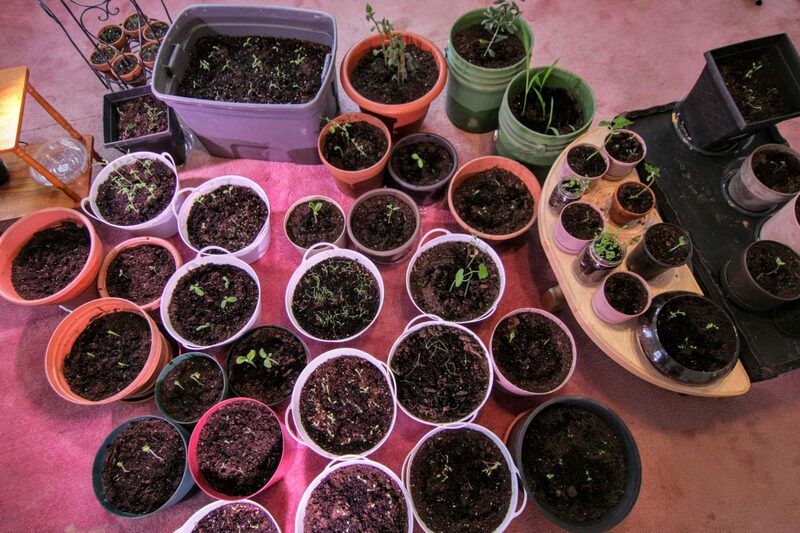 Don’t let winter depress your green thumb. With an indoor garden, get your gardening fix all year round. I do not agree with all you have said here. As the grower of the lovely lettuces and owner of the baker’s rack which we bought deliberately to serve as a grow rack shown above, I feel the need to state that I have *never* used special grow lights in my shop light fixtures that hang on the rack. I buy whatever is the least expensive both when setting up, and if I need to replace. I do, however, give a hearty second to keeping the lights close to the plants. I think that is the most common “beginner mistake” along with thinking that the light of a south facing window, alone, will be sufficient. Thanks for your comment, Jj! Some plants — especially leafy greens — are less finicky than others. As I have been exploring indoor gardening more and more, I have learned that, while grow lights are certainly preferred, regular lights will work for these more forgiving crops. And a south-facing window is always a blessing, of course! Thank you again for your photo and your insights.